President Obama’s recent proposal to raise the federal minimum wage (from the current $7.25 to $10.10) has rekindled the multi-decade old argument over whether raising the minimum was is a good or bad idea. Opponents of the increase argue strongly that it will only hurt the economy by raising costs and unemployment, and in effect, hurt the poor (the intended beneficiary of such an increase). Economists are largely divided on this. Opponents claim that raising the minimum age will only increase labor costs, which will cause employers to in fact, shed jobs. Proponents argue that this view is simplistic and flawed, as it ignores the fact that costs can be shifted elsewhere (including decreasing or flattening the pay of highly-paid executives higher up in the employment food chain), and that it also ignores the benefits that companies will see as a result of increased demand (from low-paid employees who will now have more money to spend). Fortunately, we are not stuck to debating hypotheticals based on one’s preferred economics school of thought. We can compare the dates of minimum wage increases and look for adverse effects on unemployment rates or economic growth. In doing so, we don’t find any evidence that past increases in minimum wage has had an adverse effect on either. 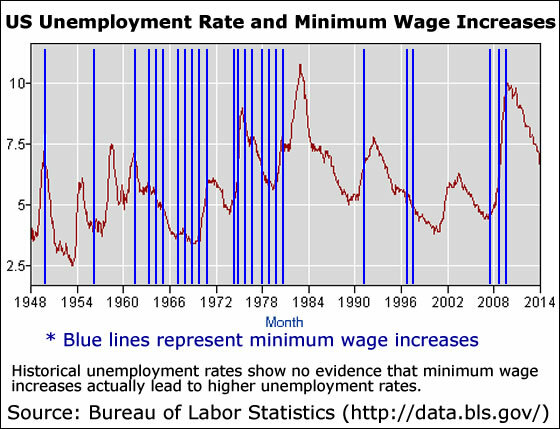 Has Raising the Minimum Wage increased unemployment in the past? A look at historical minimum wage increases and unemployment shows no relationship between the two. There are instances of unemployment both rising and falling after or during such increases. We see instances of the minimum wage being raised during a time when unemployment was either rising or falling, and see no change after the increase. Of course, one could cherry pick a point in history in order to argue a preconceived point of view, but on aggregate, it would appear that these increases have zero bearing on the unemployment rate. Has Raising the Minimum Wage slowed GDP growth in the past? 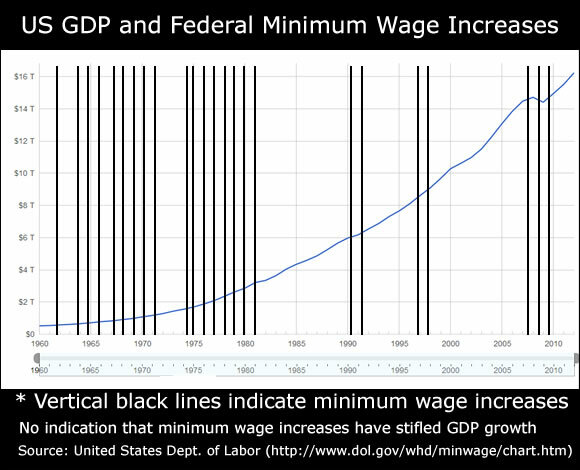 There is no indication that minimum wage increase have ever stifled economic growth. GDP has grown steadily with or without minimum wage increases. The belief that minimum wage increases will lead to unemployment is grounded in the belief that employee wages (at least for those earning less than the proposed increase) are part of an inelastic and rigid cost structure. But in the real world of business, costs are shifted around. Items are sometimes sold or services are provided at (or even below) cost in order to maintain a customer base, and subsidized through other means (sometimes charging more for other items/services). But the real elephants in the room are the facts that 1-CEO-to-worker pay ratio has skyrocketed in the last 30-40 years and that 2- corporate profits are at record levels. The argument that increasing the minimum wage forces companies to raise prices largely ignores the explosive growth in CEO (and other exec) pay in relation to workers. 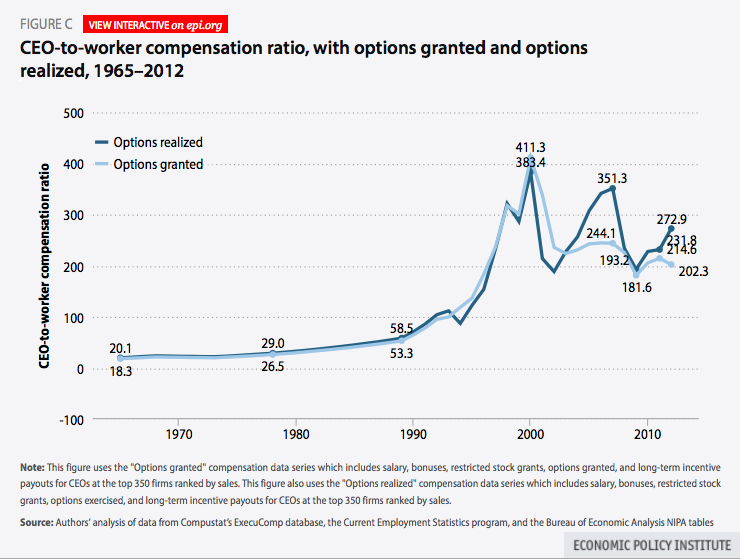 CEOs continue to earner more and more while worker’s wages continue to fall behind rising costs of living. Oddly enough, those who oppose minimum wage increase for fear of the costs they’ll impose on companies are generally unconcerned about the costs this imposes on companies. Theoretically at least, an increase in the minimum wage could (and indeed, some would argue, should) be offset by a tapering off or at least a flattening of rising CEO pay. 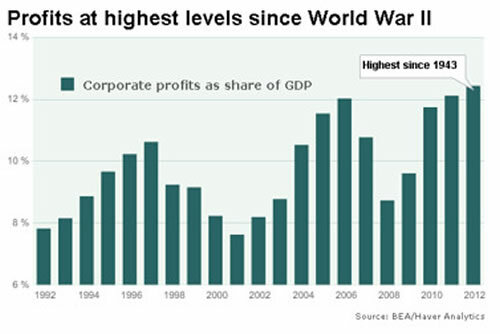 That corporate profits are at their highest level in decades (and so shortly after such a disastrous economic downturn, and while so many people are still out of work) flies in the face of the idea that businesses are squeezed dry as it is (and that therefore, paying employees more necessitates raising prices, or laying off workers), and that corporate profits are somehow commensurate with the plight of workers. Proponents of the minimum wage increase also argue that raising the minimum wage will also increase purchasing power for those who need it the most. Lower income earners spend a higher portion of their paycheck (whereas higher income earners are more likely to save it or invest it overseas). Putting money into the hands of those who spend their their entire paycheck means putting more money back into the economy. This also means that even businesses who have to increase their payrolls to accommodate their lower-paid workers will experience an increase in sales due to increased spending among lower-paid earners. Another argument put forth by proponents of the increase is that workers who are paid better will in fact, produce more, thereby lowering costs in other ways. Employers will save money by way of lower turnover (lowering the cost of hiring new replacement employers) and improved attendance as well as quality of service. It’s ironic that many of the same sources who oppose the minimum wage increase are the first to complain about lower-paid worker’s use of social services. Paying low income workers more reduces their dependency on these services. One report estimates that a single “Wal-Mart supercenter employing 300 workers could cost taxpayers at least $904,000 annually.” Another report estimates that American fast food workers receive over $7 billion in public assistance. Over the last several decades, median wages have fallen behind rising costs of living while the top earners have experienced a windfall. 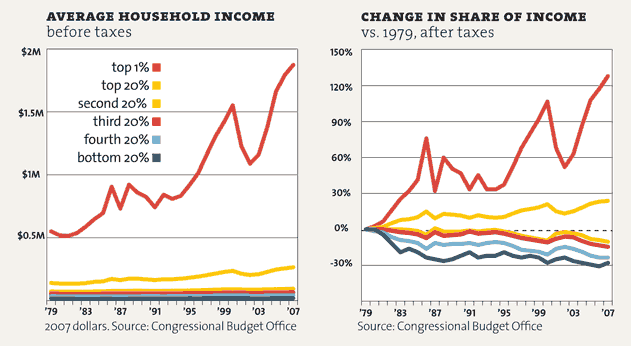 In fact, the US has the highest income disparity it’s ever had since 1928, and advanced nations. Many economists believe that this continued loss of buying power by such a wide base of the economy has made the economy more dependent on credit, and more susceptible to credit bubbles. Whether one believes that the growing inequality is “bad” and something that should be remedied, or something that is “unavoidable” and not to be tinkered with, it does appear that most Americans underestimate the level of inequality that persists. 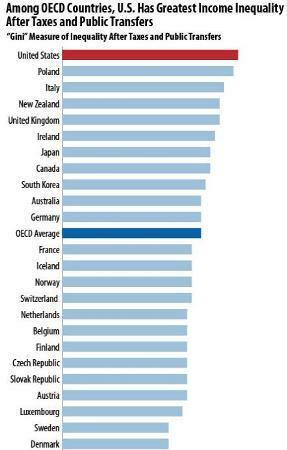 Here’s The Most Simple Argument Against Raising The Minimum Wage. It’s Not As Simple As You Think.